What is an Arizona Eviction Notice? Arizona Eviction Notice: What Is It? An Arizona eviction notice is a written document given to the tenant by the landlord. It gives the tenant a certain amount of time to correct a violation of the lease or to vacate the property. Sometimes, it demands that the tenant leave the property and doesn’t give them the option to correct the lease violation. Eviction notices are also known as a notice to quit. All eviction notices in Arizona must comply with the state’s landlord-tenant laws. What Are the Components of an Arizona Eviction Notice? A Notice of Irreparable Breach is used when the lease agreement is violated in such a way that it requires the tenant to leave the property immediately. There is no amount of time given to the tenant to correct the lease violation. Essentially, this type of notice is given if the tenant is involved in illegal activities such as prostitution, gang activity, manufacturing of drugs, and creating a nuisance that threatens the health or safety of the landlord. This eviction notice must comply with ARS §33-1368(A). This eviction notice must include all the basic components mentioned above as well as a list and description of the irreparable breaches. In the interest of safety, the landlord should opt to serve the tenant via certified mail or hire a private process server. The tenant may be served in person, but notice may not just be left on the door of the property as that is not considered proper service according to state law. Under ARS §33-361, rent is considered late if it is not paid within five days of the due date listed in the lease. After that date has passed, the landlord may issue a 5-Day Notice for Non-Payment of Rent. The tenant then has five days to pay their rent or vacate the premises. This eviction notice must include the basic components that identify the tenant, the landlord, and the property as well as list the amount of past due rent, the amount of any accumulated late charges, and the date by which the rent must be paid. A 5-Day Notice for Non-Payment of Rent must be personally served by the landlord. If they are unable to do so because the tenant isn’t available, the landlord may use certified mail. If the landlord serves the tenant via certified mail, the tenant has 10 days to pay rent instead of 5 days. The landlord may not leave the notice on the tenant’s door. That is not considered proper service under state law. A 10-Day Notice to Quit for Lease Violations is an Arizona eviction notice that is for all other lease violations outside of irreparable damage and non-payment of rent. It gives the tenant 10 days to correct the violation or vacate the property. This eviction notice must comply with ARS §33-1368(A). In addition to the basic components that identify the parties and the property, this eviction notice must include the date the breach or breaches took place and a description of the breach or breaches. This notice may be served personally by the landlord, by a private process server, or through certified mail. It cannot be left on the door as that is not considered proper service in the State of Arizona. A 30-Day Notice to Quit for Month-to-Month Tenancies isn’t an actual eviction although it gives the tenant 30 days to vacate the property. It provides 30 days notice of the end of the lease as required by ARS §33-1375. 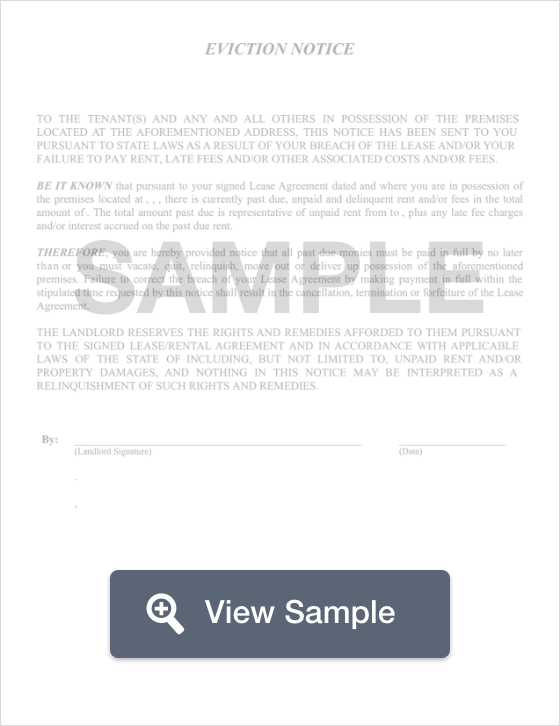 This notice identifies the parties, the address of the rental property, and gives the tenant the date that the lease agreement will terminate. It is helpful to use a Certificate of Service. That portion of the document is signed by the person making the service. Remember that you cannot leave this notice on the front door. That is not considered legal service. What Are the Legal Considerations of an Arizona Eviction Notice? All Arizona eviction notices must conform with state law. You can read the state laws for each of the most common notices used. Evictions must be legally served or the tenant isn’t required to vacate the premises or correct any defects. An eviction notice is the first step that must be taken in the eviction process. A landlord cannot file a complaint for eviction if they do not serve the tenant. Eviction notices must provide the proper amount of notice to the tenant to correct the defect or vacate the property. The amount of time depends on the type of notice. Proper service must also take place. Leaving the notice on the front door is not considered legal service. Depending on the potential of violence, the landlord may consider hiring a professional process server. Not all evictions are legal. The most common forms of illegal eviction include retaliatory eviction, “self-help” eviction such as changing the locks, removing the tenant’s property, turning off the utilities, threatening the tenant, or evicting for discriminatory reasons. To learn more about illegal evictions in Arizona, contact a landlord-tenant lawyer. Finally, while domestic violence victims may terminate their rental agreement early and the landlord may change the locks if there is a protective order in place, a domestic violence victim may not be evicted simply because they are a victim. If you receive an Arizona eviction notice, read it carefully. It will tell you how many days you have to correct the lease violation (such as paying the rent) or vacate the property. If you’re served for non-payment of rent, the notice should tell you how much you owe in rent and late fees as well as the last day you have to pay. If you have questions or want to discuss the eviction notice, contact the landlord. Remember to remain calm. You do not want to exacerbate the situation. Keep in mind that if you are evicted, you may have a tough time finding adequate housing in the future. An eviction for past due rent or damages to the property may also appear on your credit report. You also have the option of consulting with a landlord-tenant lawyer to have your questions answered. This is particularly important if you think it is possible that the eviction is illegal in some way. As a tenant, you have legal rights. If you cannot afford a lawyer, look for legal clinics hosted by law schools and legal aid clinics that may be able to help you. As a landlord, an eviction notice is helpful, but it must comply with state law and include the proper amount of time that the tenant is legally entitled to in order to resolve the issue. Eviction notices must be legally served. In Arizona, you may not just leave the eviction notice on the front door. If you illegally serve or illegally evict a tenant, you could open yourself up to a lawsuit and be ordered to pay fines as well as give the tenant financial compensation. If you have questions about how to properly draft an eviction notice, it may be worth it to you to schedule an appointment with a landlord-tenant lawyer.